Kolam is one of the traditional practices mostly followed by south Indians. They consider it to be auspicious because they believe that these patterns drawn in front of the house brings Goddess Lakshmi to the house and also gives a decorative welcome to the house. Actually, the truth behind drawing these geometrical patterns was that they are drawn using rice flour and this feeds the ants and other small living beings wandering outside. The Hindus considered this as a good sign. This was one of the favorite hobbies for women in those days as they increased their creative thinking skills. The women usually clean the ground with cow dung, as the cow dung acts as an antibacterial solution that prevent germs or any harmful diseases entering the house. Then the kolam is drawn using the rice flour and decorated very well. It is really a mesmerizing feeling to see the women drawing kolam early in the morning. There will be an invisible competition happening every morning on who is drawing kolam first and whose kolam is best etc. The kolam is also drawn at the entrance of the pooja room. Usually, they used to draw kolam every day before some years, as people nowadays are very busy we can see kolam in front of the houses only on Auspicious days or festivals. Marghazhi is a Tamil month that falls on mid of December to mid of January, this month is considered to be auspicious by Tamilian and they decorate their houses with beautiful kolam this entire month. This is the best time for kolam lovers and kolam learners as they practice kolam early in the morning with a cool breeze. People nowadays start using so many materials to make the kolam look more attractive and bright. 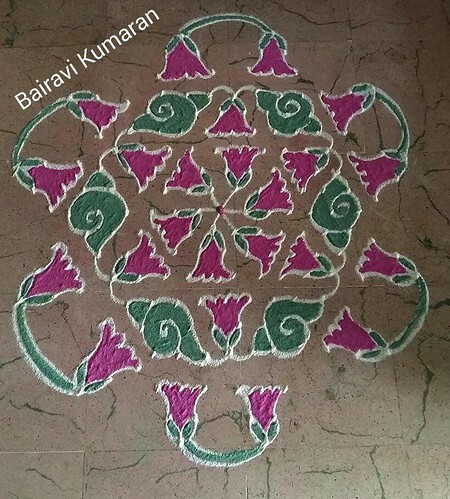 They use rice flour mixed with water, bring it to the paste like consistency and then draw the kolam to make it look bright. There are so many color powders available in the market which can be used to make the kolam colorful. 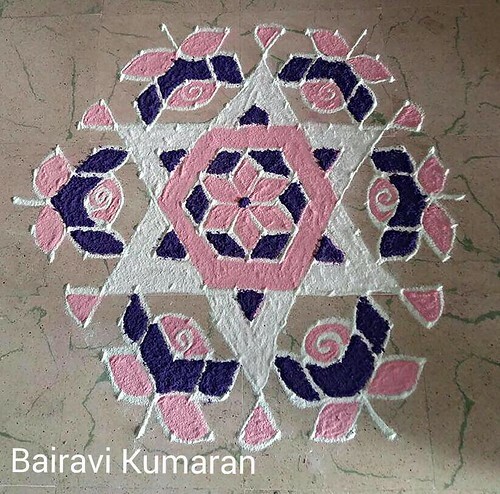 The finely ground white stone powder is used to give a definite finish to the kolam , the outline given with the brick stone powder, which is called as Kaavi, gives a beautiful look to the kolam. This creativity has gone to the next level by conducting competitions in the streets to check whose kolam is the best. These competitions are conducted on various occasions so that we do not forget our tradition. Kolams are of different types, out of which the dot kolam or the pulli kolam falls in the more traditional way. The dotted kolam can be drawn in two ways, by joining the lines with each dot forming a beautiful design are by drawing curvy lines around the dots. These type of kolam is called kambi kolam or sushi kolam. There rollers, plates, and boxes available with tiny holes designed in it. The kolam powder is spread over these plates and imprinted on the floor. This gives the design that is on the plate or the roller. Pulli kolam has its own advantages. It will be a defined one. You won't get distracted or confused in the middle of drawing the kolam on what to do next. If you want to be creative everyday and want to go with your own flow, go for freehand rangoli designs. Pulli kolam is the best for the people who like to go with a traditional way of drawing kolam. You can only see pulli kolangal, also known as rangoli with dots in most of the houses in villages. Women struggle to draw Pulli kolam in the initial days of learning pulli kolangal with dots. Here are some tips to learn pulli kolam easily. 1. Start practicing pulli kolam on paper first so that you can understand the things. 2. Start with a simple 3 dot pulli kolam. Then you can proceed and progress with 4 dot pulli kolam, 5 dot pulli kolam, 6 dot pulli kolam, 7 dots pulli kolam and 9 dot pulli kolam. After practicing these simple dot kolams, proceed to 10+ dot kolams and 20+ dot kolams. If you try to start 20+ pulli kolam, you will be confused a lot and it might lead to loss of interest very soon. First of all, I would like to thank Mrs.Bairavi Kumaran who happily gave us permission to feature her pulli kolam designs here. For more rangoli designs, you must visit her page. Let’s have a look at the different types of kolams with pictures given below. We have given rangoli designs with dots with medium difficulty level. We are planning to put separate posts for simple dot kolams like 3 dot pulli kolam, 4 dot pulli kolam, 5 dot pulli kolam, 6 dot pulli kolam, 7 dot pulli kolam and 9 dot pulli kolam. As of now, enjoy the below medium pulli kolam designs. This is a beautiful dot kolam design surrounded with curvy lines that gives a geometric shape. 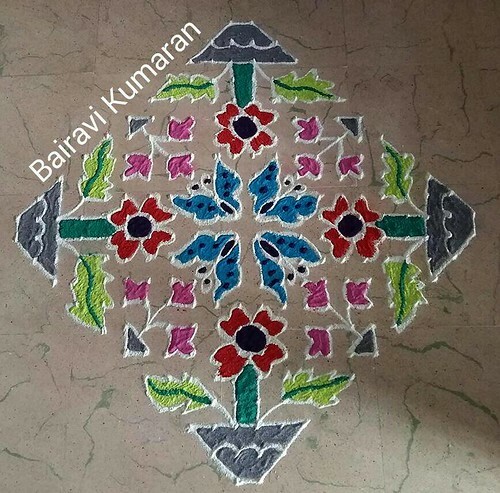 This kolam can be very small or even very large, that depends on the design of the kolam and the number of dots that you opt for. This is not a simple pulli kolam and it is not definitely recommended for beginners. 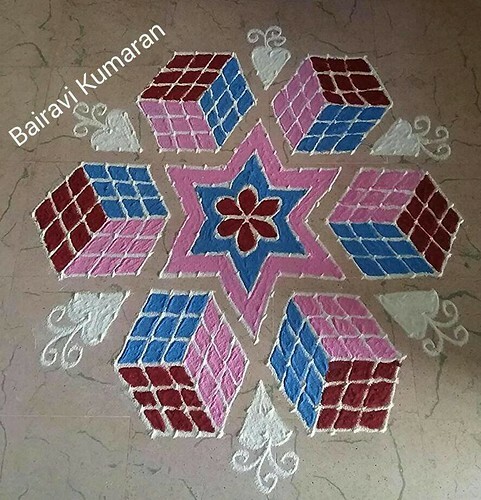 This type of kolam is little bit difficult if you do not find out the pattern it has as the lines that connect are very confusing, so the well- practiced people can only draw this kolam without any mistakes, because if you make any small mistake this will confuse the entire design. The kaavi outline gives a beautiful look to the kolam. You can replace the kaavi color with any other rangoli color powder. During Margazhil season, this pulli kolam looks wonderful when you draw in the early morning in front of your house. This is one of the most familiar rangoli designs with dots in Tamil Nadu and very easy to practice for the beginners. You have to keep the dots carefully and then connect it with the other dots to form a design. 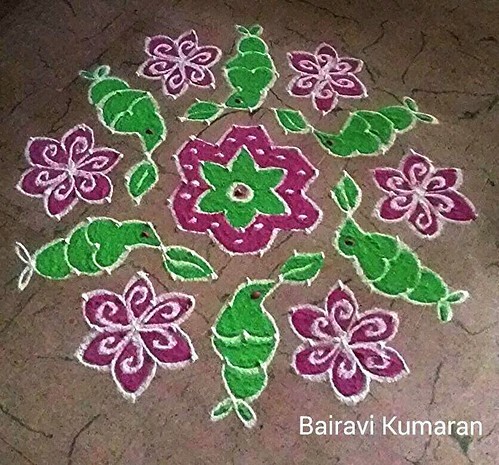 Here the sangu is given green color and the flower is given purple color that makes the kolam look brighter. Do you see how the two colors were beautifully used? The color combination matters here. 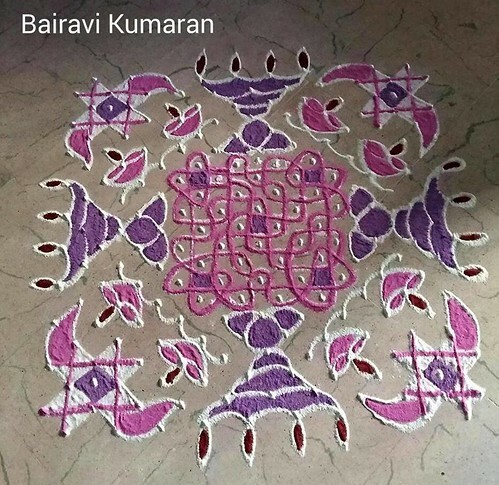 This pulli kolam is drawn with just two colors. However, you can try with different colors. All kolam lovers must have drawn various types of sangu kolam in their lifetime. Sangu kolam is a simple kolam design but it gives a very beautiful look to your home quite easily. Difficulty level - Medium. But it is a kolam for beginners to try their level best. This kolam is a combination of sushi kolam and sangu kolam. The interior part is designed with the straight lines and the exterior part is the outline that is drawn out of sushi kolam. The inner part alone is given color inorder to give a neat look. As you can see, the difficult lies in drawing the curves and not in the interior design. If you are very good in drawing curved lines, this kolam is not at all a complex one for you. Who doesn't like parrots? who doesn't like flowers? Who doesn't lik rangoli? Who doesn't like if a rangoli can be a combo of parrots and flowers? This simple pulli kolam is just for you if you love all these things. This simple pulli kolam design gives a design like a parrot holding a leave and beside it, there are beautiful flowers. The kolam looks beautiful with the contrast colors green and purple. This gives a very neat look and also is easy to draw. Difficulty level - Easy. Even beginners can try it. This small pulli kolam has a lot of flowers and the different colors that are used on each flower make the kolam look extremely colorful. The leaves are given a combination of light green and dark green color to make the leave look different from the flowers. If it looks too much for you to try, try the small pulli kolam which is in the center of the pulli kolam. Even that small pulli kolam will look elegant like complicate pulli kolangal. This is a beautiful yet simple pulli kolam where you can show your taste of colors. You will have a lot of opportunity to play with different colors. You can use as many colors as you wish. There is no limit on it. If it looks too much for you to try, try the small pulli kolam which is in the center of the pulli kolam. Just draw the butterflies alone when you want to have a small pulli kolam that will look elegant like any other complicate pulli kolangal. It is our tradition to have a deepam kolam that has a lamp design, this kolam is mainly drawn on festivals like Diwali or kaarthigai deepam in order to symbolize that it is a festival of lights. The center part is given curvy designs surrounding the dots with the lamp design on the other four sides. There are two small lamps surrounding the big lamp and the kolam is decorated with light and dark purple color that gives a beautiful definition. 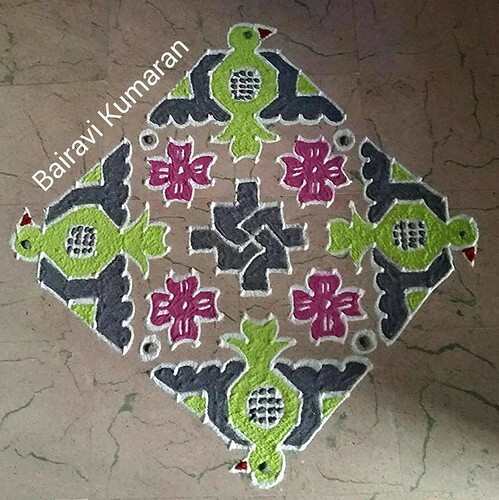 This kolam has a bird on its four sides that is given a dark and light green color. It has flowers inside that are given the purple color. 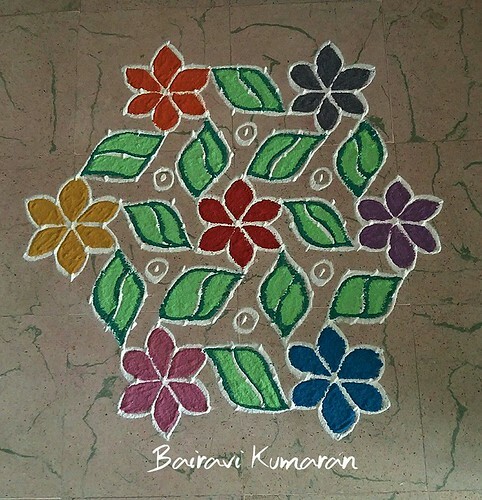 This kolam is very easy to draw as it contains only lines and patterns. 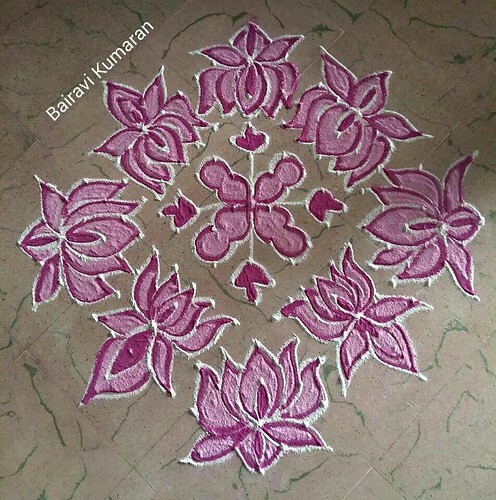 This is a very simple designed kolam. 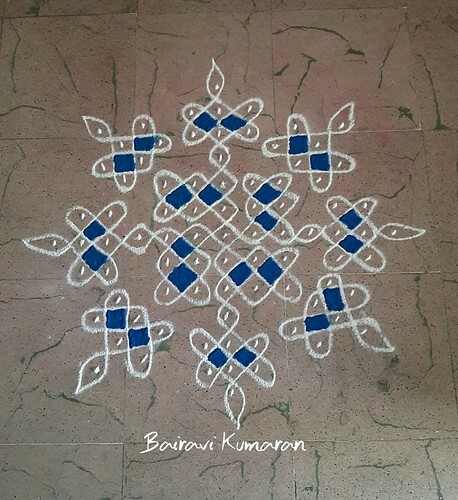 This kolam gives a geometrical pattern after you connect the straight line with the dots. You can give different colors according to your wish to differentiate the patterns. The star in between separates the pattern and the flower kind of design in between the patterns is the high light. This a kolam with lots of colors. There are leaves around the flowers that give a decorative look to the flower. 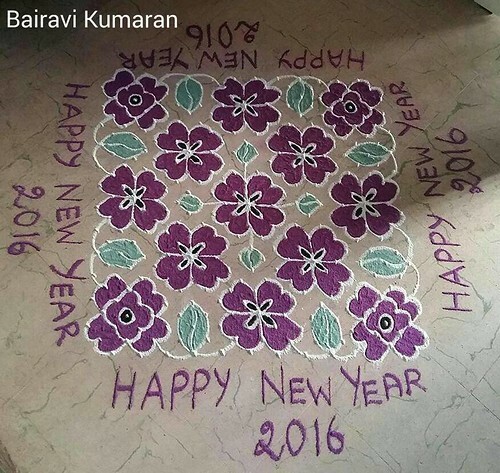 The happy New Year verses are written on the four sides of the kolam. You can customize these verses depending on the occasion. 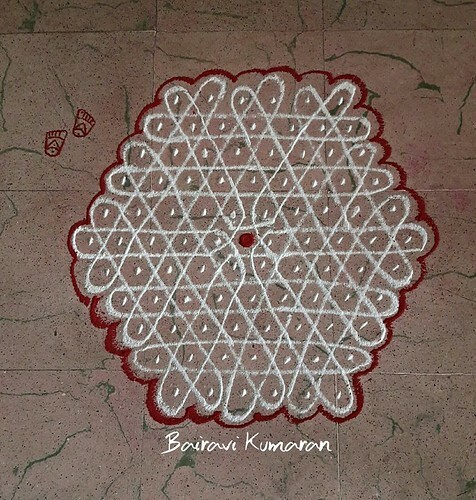 The small pulli kolam is a dot kolam connected with straight lines that give a rose shape. It is fondly called as rose kolam. There are many roses that are given multicolor like pink and purple. The star in between is given white and pink color in order to highlight the flower and the center design. This type of pulli kolangal follows a differentwheretern were the dots are kept first and the dots will be surrounded by the curvy lines to form a pattern. 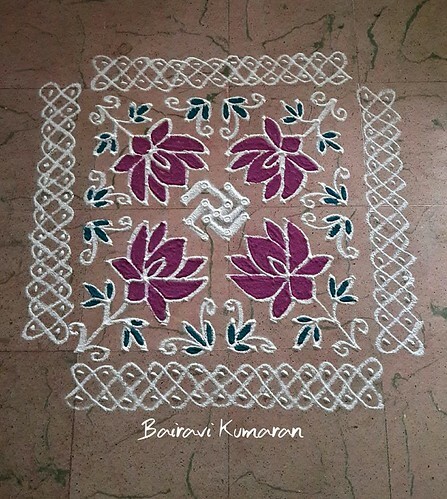 Some of the shapes in between are given colors to make the kolam look unique. Here they have given dark blue color in the center of each patterns. 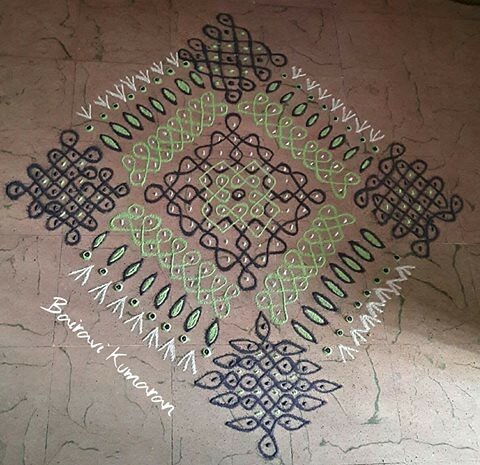 This is also the same type of kolam but this has a larger number of dots and hence the design also comes out big. They have given a contrast color of light green and dark blue which is a very great combination. If these pulli kolam looks too much for you to try, try the small pulli kolam which is in the center of the pulli kolam. Even that small pulli kolam will look elegant like complicate pulli kolangal. This pulli kolam has a beautiful lotus design that is given pink and purple color. The design and size of the lotus flower is different. These are the best to give a great look in front of your house. Hope this article helps you to know various pattern and designs used in dotted kolams. If it looks too much for you to try, try the small pulli kolam which is in the center of the pulli kolam. Even that small pulli kolam will look elegant like complicate pulli kolangal. Hope you like the article Pulli kolam with dots - Pulli Kolangal designs - Rangoli Kolangal designs with dots images.